The anatomists of the past hired wax model makers to create disconcerting displays of the human form giving birth or eaten away with disease. The lurid lifesized models were at once both anatomy lessons, freak shows and ways of instructing the uneducated about the dangers of poor hygiene, specifically the horrors of so-called venereal diseases (we no longer use the Venus association). 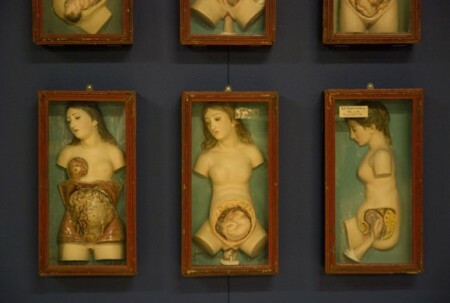 At the Wellcome Institute gallery on the Euston Rd you can currently see these horrors collected together (with a set hidden behind Victorian red velvet curtains for the faint-hearted). 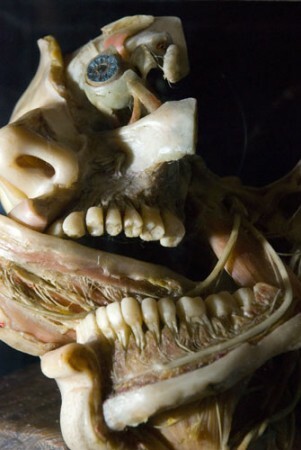 … and of course, I just had to take a look at this right before I went to bed -that mangled face takes the cake! You Brits… Oh well, sweet dreams, everyone! That’s nothing, you should have seen behind the red curtain (syphilitic gonads and much worse). I’ll never look a steak tartare in the face again. If it had a face. Okay, now I’m all set for diner tonight. Cheers! It’s disconcerting the way the heads on the girls look to the left in a kind of ‘things should have been so much better in my life’ way. Many years ago I worked in a research lab taking care of animals – purely out of desperation, I assure you. I adopted a particular guinea pig as a pet. He proceeded to die, and one of the researchers decided to do a necropsy to discover the cause. I watched out of curiosity. As he peeled back the skin from the animal’s face, I remarked, “Well, they do say that beauty is only skin deep”. Said researcher for some reason seemed a bit wary of me after that.